April 1, 2019 -- For I know that my Redeemer lives, and at the last he will stand upon the earth. And after my skin has been thus destroyed, yet in my flesh I shall see God, whom I shall see for myself, and my eyes shall behold, and not another. April 1, 2019 -- Blanche Bass, G.S. ; ; ; ; ; ; ; ; ; ; ; ; ; ; ; ; ; ; ; ; ; ; ; ; ; ; Colchester Grange #78 Carroll Miner, G.S. ; ; ; ; ; ; ; ; ; ; ; ; ; ; ; ; ; ; ; ; ; ; ; ; ; ; N. Stonington Comm. Grange #138 ; “Well done, good and faithful servants.” ; Please keep us notified of deceased members. ; Use the email or the regular mailing address listed in the Granger Staff list in this . . . The office of Chaplain sponsors, supports and encourages Grange activities and its members' reflection on faith and concerns of the spiritual dimensions of life. These concerns include the relationship between personal faith and social issues. Cathedral of the Pines . 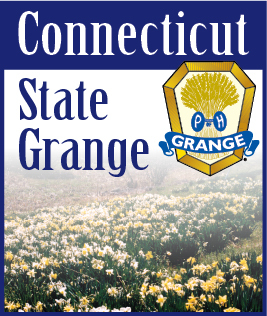 . .
New England Grange Sunday is held each June at the Cathedral of the Pines located in Rindge, New Hampshire. Please visit their website for more information on this thriving center situated on a hilltop with a panoramic view of the Grand Monadnock. From the Chaplain's Desk - What does the Lord require? From The Chaplain's Desk: Why Worry? From The Chaplain's Desk: What Is Grace? From The Chaplain's Desk: Am I My Brother's Keeper? May 2015 Chaplain's Corner: Unspotted from the world?